One cannot know the sense of being alone I felt after my neurologist gave me a diagnosis of vascular dementia – and possibly Alzheimer’s disease. He said that there is no cure, that I should settle my affairs and other things that did not register in my mind until much later. Although I researched Alzheimer’s disease as soon as my family doctor referred me to the UBC Brain Research Centre, I was not prepared to accept my diagnosis. My mind was flooded with images of people living with dementia that were, to say the least, not pretty. I imagined a person stripped of his personality, unable to care for himself, isolated because the people who care for him don’t understand his illness and aren’t trained to address his needs. My dementia journey began with that fateful diagnosis, but through compassion and support – from a caring gerontologist, social workers and both the Alzheimer Societies of B.C. and Canada – I want to share my story with you and tell you that I am doing very well. And having met so many other people living with the disease, I want to share with you our greatest concern. The sense of losing one’s identity, of being a burden to the community and to the family. There is so much stigma associated with dementia that sometimes people are very reluctant to seek a diagnosis or ask for help. Some people try to hide their challenges from their family and friends for fear of being ostracized. I have met people living with dementia from other cultural and ethnic backgrounds who have experienced other people’s assumptions or beliefs that dementia is a punishment rather than a disease that needs to be addressed. After I was diagnosed, it took a long time to decide to tell the people in my life about my dementia. After I did, though, I was motivated to become an advocate for greater awareness of the disease. I believe that a person with lived experience of the disease is its best ambassador, and that we can educate the public to better understand that people living with dementia are their family members, their friends, their neighbours. Through the Alzheimer Society of B.C., I have been involved with several initiatives to help create this awareness, including the Society’s advisory group for people living with dementia, as well as with the Dementia-Friendly Burnaby Working Group. This has given me a chance to act as a spokesperson and presenter to help educate the public. On the national level, I have had the opportunity to work with the Alzheimer Society of Canada as part of an advisory group that helped create a Canadian Charter of Rights for People with Dementia. This is a historic document that allows people living with dementia to feel confident they have not lost their right to a meaningful life and to being members of their community. Last year, my advocacy brought me to Ottawa, where I attended a conference connected to the development of a national dementia strategy. Over the course of the day, three key themes emerged: awareness, stigma reduction and education. These are simple yet ambitious goals that require us – all of us, whether we’re living with the disease or not – to harness a collective voice. This Alzheimer’s Awareness Month, we have an opportunity to begin to change the conversation around Alzheimer’s disease and other dementias. It won’t happen overnight, but that change comes from sharing our stories openly and challenging stigma head on. This is an invitation to all of you to be a part of that change. To learn more, visit ilivewithdementia.ca. Mario Gregorio is a retired Data Analyst who arrived in Canada from the Philippines in the mid-1970s. 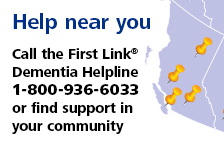 Diagnosed with vascular dementia and Alzheimer’s disease in 2008, he accessed support and education through Alzheimer Society of B.C.’s First Link® dementia support. Living alone and independently, Mario is a long-time dementia advocate and volunteer with the Society and other organizations, like Tourism Vancouver. An avid photographer, he contributes photos to publications where he volunteers. He lives in Burnaby.